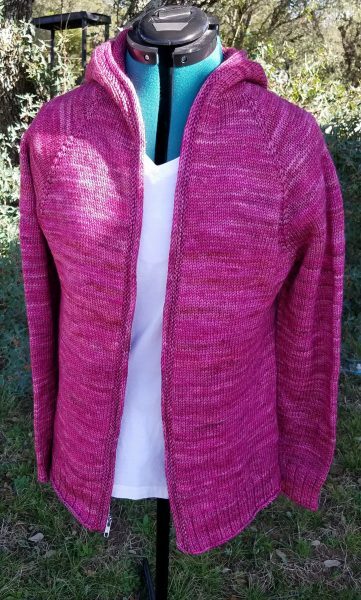 The pink jacket is finished! It’s a perfect fit. The zipper was easy. 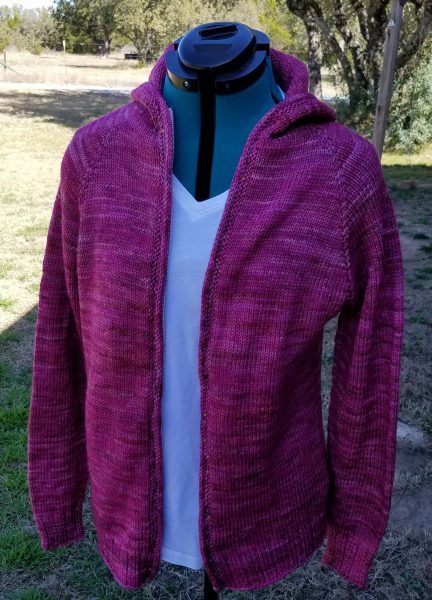 I absolutely love this lightweight hooded jacket. This is absolutely as close to perfect as anything I’ve ever made. 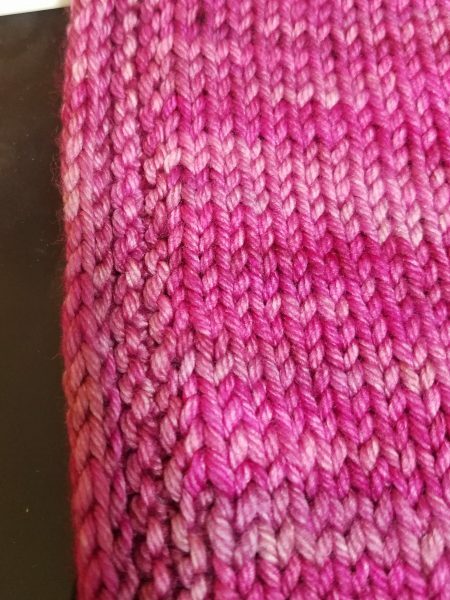 The pattern was so easy to follow and it’s a quick knit. 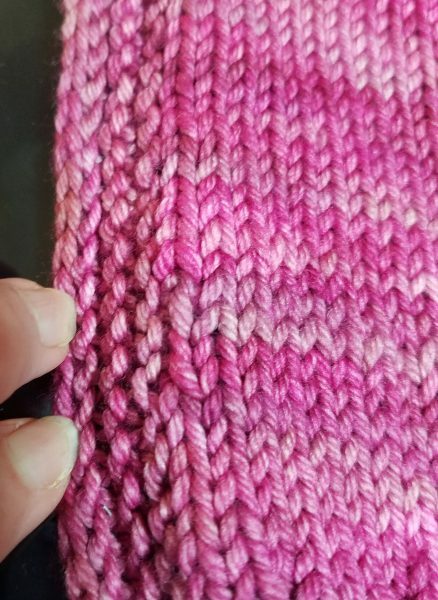 Nothing fancy – just lots of stockinette. The pattern has not been released yet but I will let post here when it is available. It will include children’s sizes from size 2, all the way up through men’s size 50″. I’m sure that mine will be worn almost exclusively open. The pink on the zipper doesn’t show and since I’ll be wearing a white or pink shirt under it, I’m not concerned that I used the lighter zipper. The zipper was not hard to get in. I was dreading it! I even contemplated putting buttonholes and buttons or some kind of toggle buttons but I’m glad I went with the zipper. Someone had asked the other day for me to please explain how to put a zipper in. This is the first time I’ve done it! I’ll tell you how I did it but you may not want to take my word for it. There are lots of youtube videos out there. I watched several til I was confident I could do it correctly. First, I pinned the zipper in (shown below), being careful not to stretch the sweater. The I-Cord bind off helped tremendously. After I was sure I had it in so that nothing was stretched out of shape, I tried it on me, then put it on the dress form so I could look at it from afar. I was happy with it. I’m not sure you can see it but the I-cord bind off left a rolled edge of sorts. To sew the zipper in, I pulled the rolled edge towards the zipper’s teeth and hand stitched through the “ditch”. When I let go of the rolled edge I was pulling away, it went back to cover the ditch so none of the stitching shows. Now . . I’ll get busy and get the shawl finished by the weekend and then I’ll have all my test knits finished. It is absolutely beautiful! Will look super nice on you! Great job on the zipper too. Oh my oh my oh my!! That is SO PRETTY!! I really like this Dash jacket. The color is great. Thanks for the info on putting in the zipper. Absolutely awesome!! 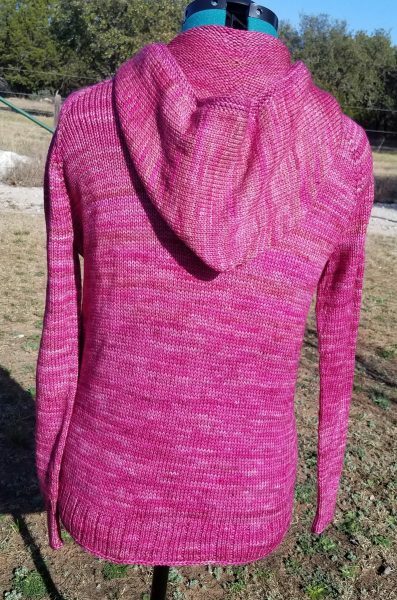 I too love Malabrigo Rios yarn! 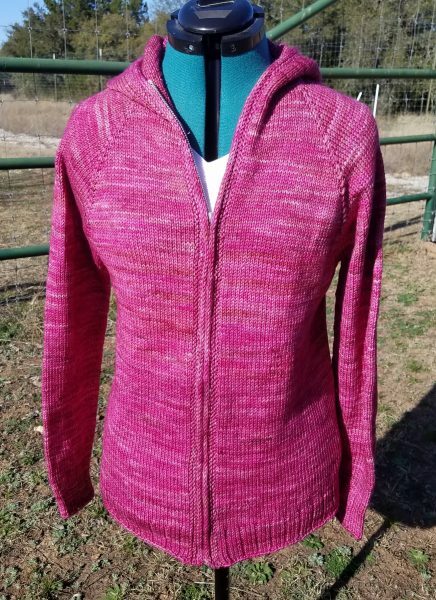 I’m fairly new to knitting–4 years or so–but this past year I’ve made four sweaters and have two in progress and all are Rios yarn. It’s not only beautiful but is wonderful to work with!! Yes! One step at a time. I get confused every time I try to look ahead and figure it out. Looks great! Very nice over that pink shirt, too.